It's important if you live in California to buy California seedlings to ensure the healthiest trees. Seedlings are young trees that ship easily. They can be an economical alternative to buying large specimens. If you've ever browsed through fruit tree catalogs, you may have noticed that some plants are marked "Cannot ship to CA, AZ" or other states. Because so many food crops are grown in those states, laws exist to protect the growers from viruses or insects entering the state on trees grown elsewhere. Fruit and nut trees, for example, may not be shipped to residences within California unless they're grown in California. For some trees, such as pecans, trees may be grown and shipped from Arizona or California to California homes. The easiest way to avoid confusion is to simply buy California seedlings. California seedlings have been grown or raised within the state. These trees are usually hardy to California's unique climate and if you're shopping at your local nursery or garden center, chosen to thrive in your location. Always check with your local County Cooperate Extension office for help choosing varieties for specific locations. California contains such a diversity of climates, from mountains to beaches to cities, that it's important to speak to someone locally for help choosing just the right tree for your location. The Fresno Master Gardeners provide a shopper's guide to deciduous trees that may be helpful if choosing California seedlings near the Fresno area. California supports two state nurseries. These nurseries grow many native species of trees and distribute over two million California seedlings annually. There are two state nurseries: the L.A. Moran Reforestation Center (Moran) and The Magalia Reforestation Center (Magalia). While both Moran and Magalia produce trees and seedlings to be distributed to landowners, Moran tends to have more seedlings and seeds and Magalia more bare root trees. Trees are grown in pots and are available from late October through late May. For more information on how you can obtain California seedlings from these two centers, visit the state forest website. One of the most novel uses of California seedlings of late has been the incorporation of tree seedlings as "green" wedding favors. Many California brides have been buying giant sequoia tree seedlings, for example, in specially wrapped burlap packages and giving these away as wedding favors. While it beats ashtrays or matchbooks, unless guests have room to grow or the desire to tend seedlings, you may want to opt for something non-perishable instead. If you've got your heart set on California seedlings, sequoia and redwood seedlings make unique green gifts. California seedlings provide an economical alternative to planting trees. Instead of paying for a large specimen, you have the pleasure of planting a seedling and watching it grow. 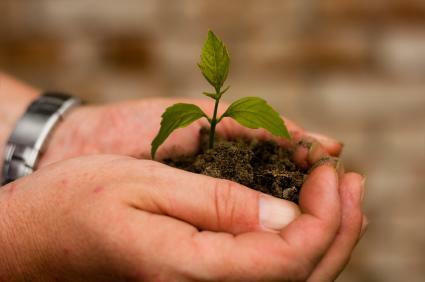 Planting trees adds beauty to the landscape, and healthy seedlings provide years of enjoyment.